That second grandchild doubles the fun! 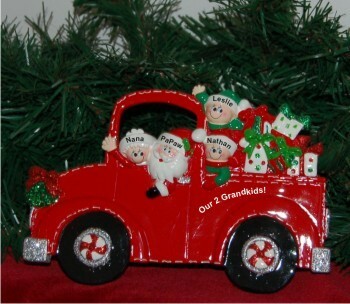 Commemorate his or her arrival with the very jolly and bright Santa's fire engine tabletop: Our 2 grandkids with 2 grandparents personalized Christmas ornament from Russell Rhodes. These grandparents ornaments personalized with hand-lettered names and custom message are ideal as keepsakes for grandchildren too! Celebrate the joy of being together for the holidays with Santa's pickup truck our 2 grandkids and 2 grandparents tabletop personalized Christmas ornament that will brighten the entire season when displayed on a table or mantel.